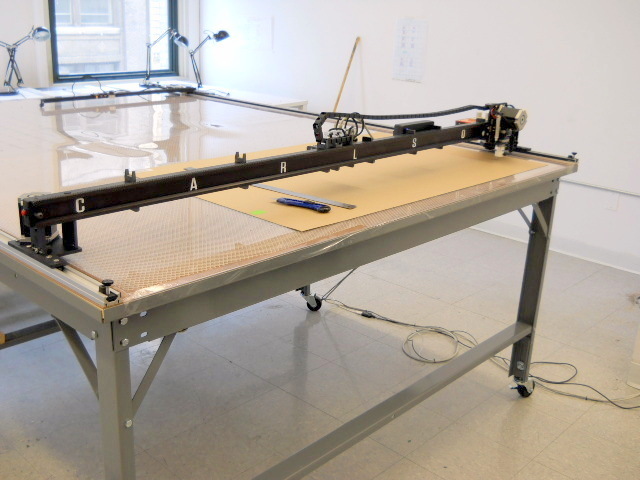 We installed our STx-72 “Studio” plotter/cutter at Parsons The New School for design. While Parson’s may be called “The New School”, they have been one of the most innovative schools in the world for “artists, designers, scholars, businesspeople, and community leaders for more than a century”. Located in the heart of New York City, they have class rooms and departments spread throughout one of the world’s most densely populated metropolitan areas. To meet the needs of their diverse course offerings and urban campus, they needed a versatile plotting/cutting system that had a small footprint, light weight and easy to transport gantry, simple to operate interface, easy to assemble and maintain hardware, and still be robust enough and safe enough for student use. 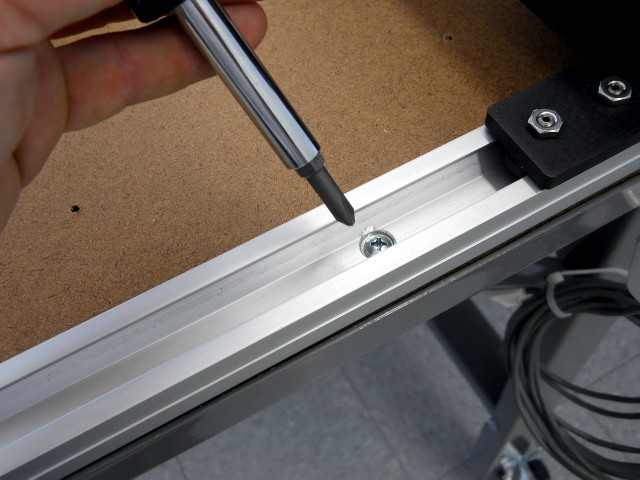 The Studio uses Carlson Design "magnetic mount" cutting tools and quick-change pen holder. 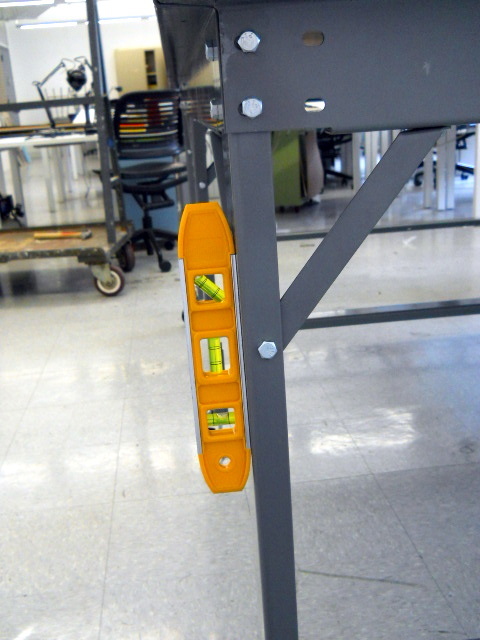 This allows Students to quickly and safely change blade holders without tooling. 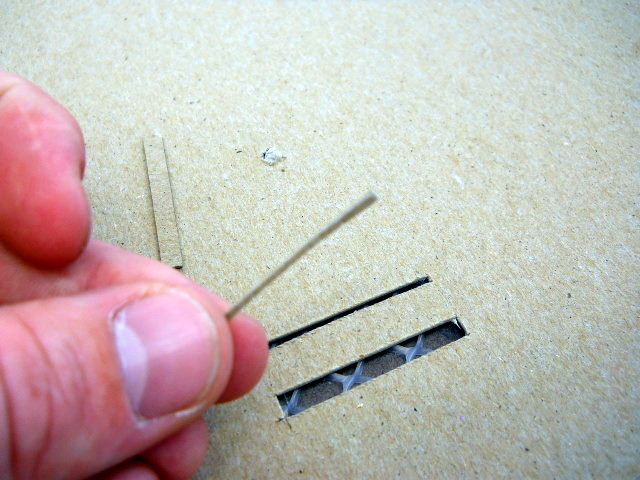 On the same table; instantly switch from cutting .030" or .050" chipboard for model making to Muslin used in pattern making. 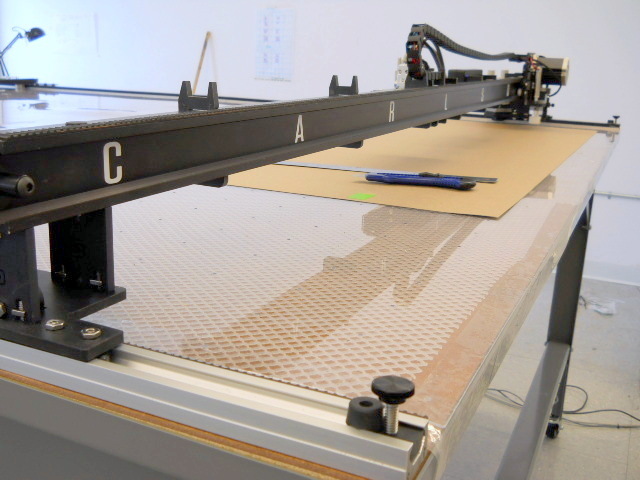 Here’s a quick, uncut video of the Studio plotting and cutting chipboard and then cutting muslin: https://vimeo.com/44249067 (If video is slow, please give it a second to load or sign into vimeo.com –free– to download the video). 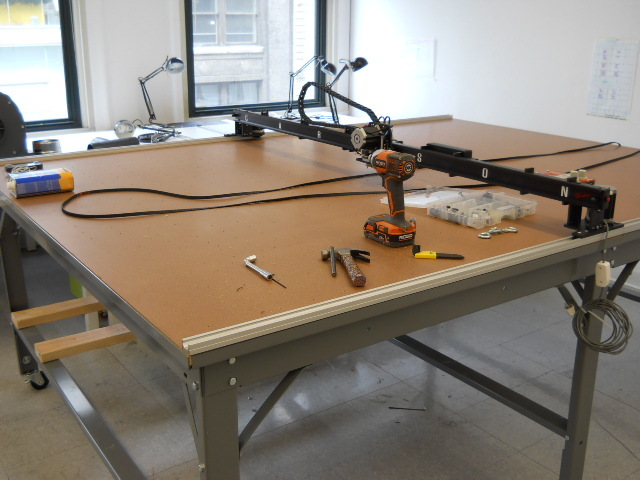 This large table can be even more versatile with the addition of our T-Bar Pattern Digitizer. This is great for tracing physical patterns that would be difficult to draw on the computer. Does your latest design finally fit your model? Lay it flat, digitize, and now you have a computer model ready to scale, modify, or repeatably cut. The T-Bar Digitizer rides on the same track as the Studio. Small foot print? Light Weight? 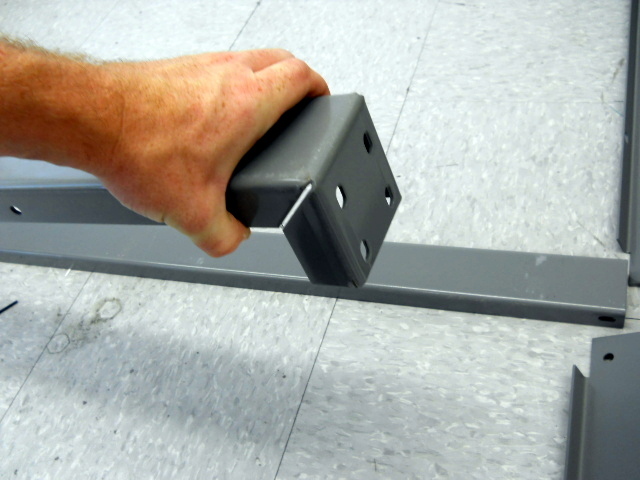 Our Track comes in short sections and can mount to almost any table top and/or even the floor. 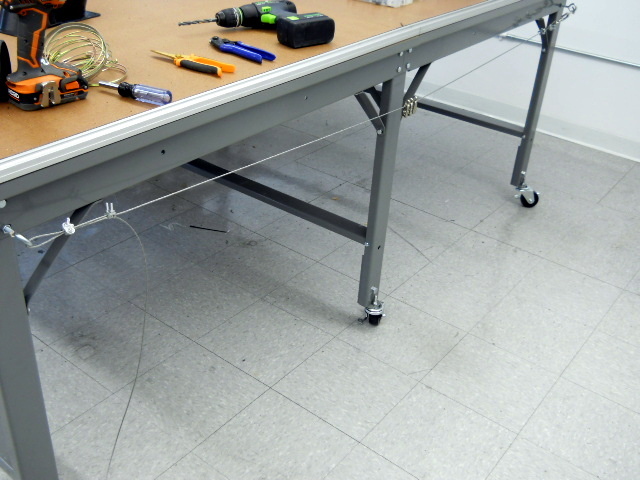 If you can secure your material without vacuum, then any 6′ wide flat surface can become your work area. 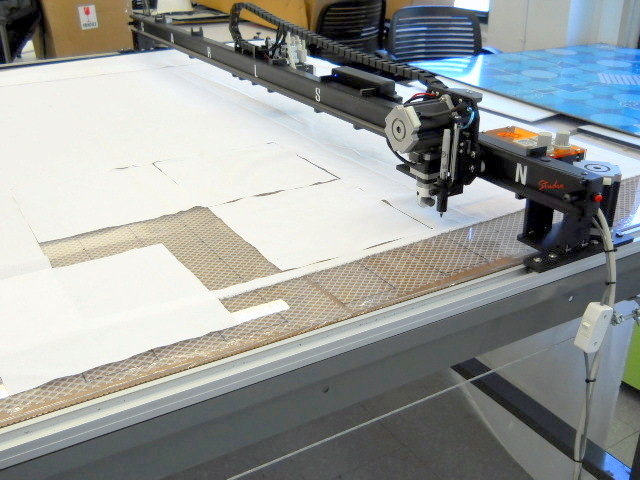 Since the plotter/cutter only weighs 16lbs, it’s easy to move to different locations. Some might think a “light weight” gantry means “light duty” performance. 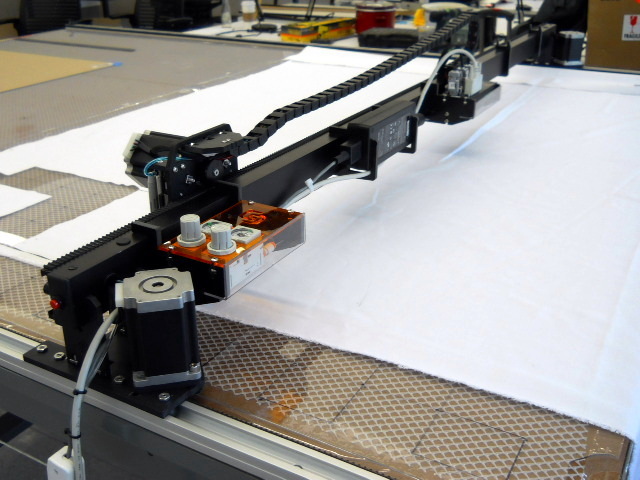 Our captive track and vertically oriented motors secure the plotter to the table and the job. This makes the studio as industrial as it is practical. 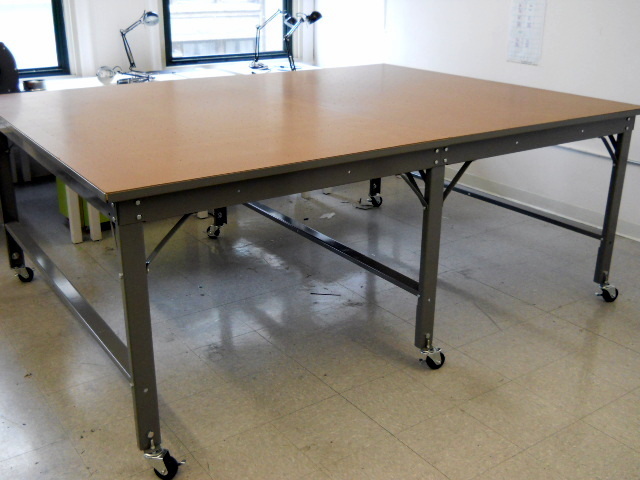 At Parson’s the Studio is riding on a two section, Phillocraft vacuum table – 6’x8′. These endless, steel frame tables can easily be reconfigured with more sections or into a single section. In the Fall, they plan to turn this 6’x8′ table into two 6’x4′ tables. 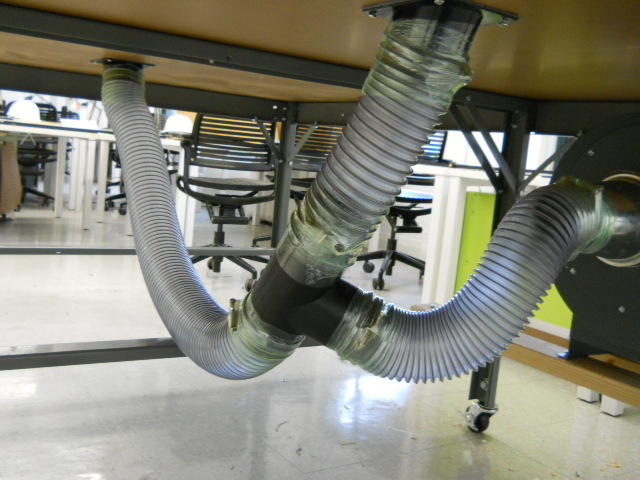 The modular foot print allows the Studio to operate in different sized classrooms. 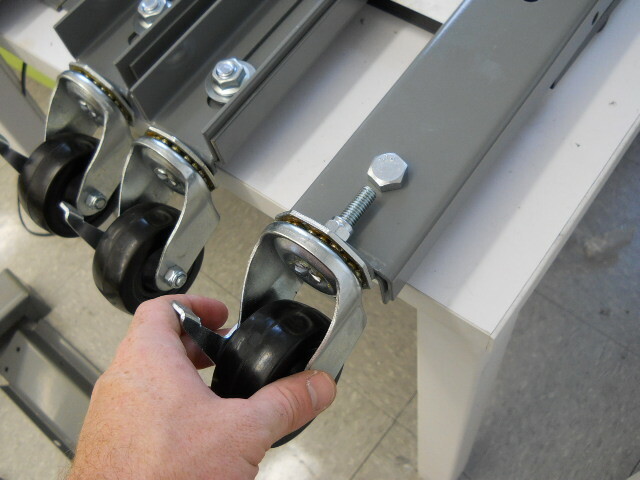 Castered Wheels make it easy to move the plotter around the classroom. Simple to maintain, operate, and service? Carlson Design software and hardware is designed to be very simple, and therefore reliable. The NEW Studio’s hardware is a study in simplicity and providing high reliability and easy service and maintenance. It uses plug-and-play, off-the-shelf components that hang from easily removable holders, “snapped” on to the back rail. 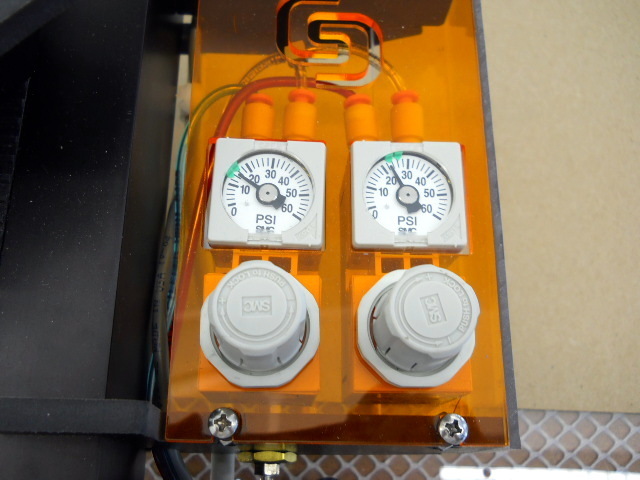 Because these are off-the-shelf consumer components and not obscure, industry specific motors and drives, they are extremely durable and affordable to replace. Most of the components are "Pluggable" and the tools and parts to replace almost every component on the machine are available in our Spare Parts Kit. 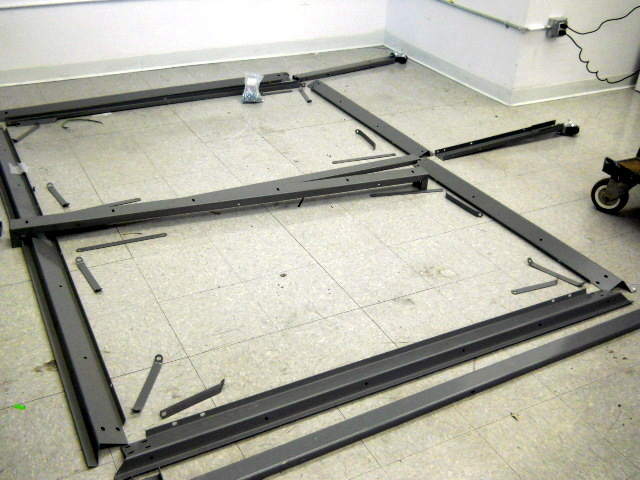 The light weight frame has several other advantages — in addition to reducing component wear-and-tear, if something cannot be repaired, the Studio is small enough to be shipped UPS or Fedex back to Carlson for repair. Our software is very intuitive and can be “preset” with optimum settings for different materials. Once configured, a student can select their material (ie. “.030 chipboard”), select their file, and hit “Plot”! Our Plotmaster software will run on any WindowsXP or 7 PC. This means students can download Plotmaster, prep their pattern on their own laptop, on their own time, and simply network the cut file or “plug” directly into the Studio’s USB cable when they are ready to plot. Parson's provided their own Windows7 PC and monitor. Better than a laser? Safe to use? 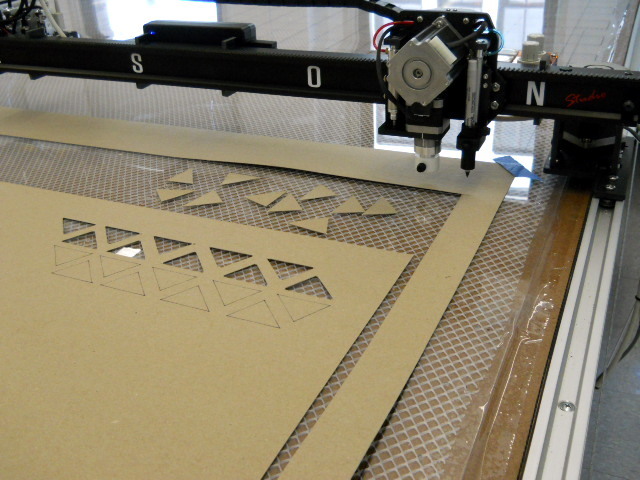 The Studio has several advantages over traditional laser cutters used in model making. Lasers produce fumes and need to be vented. Implementing venting in a large city, in old buildings, were students are working can be expensive. Think unions, inspectors, city code, OSHA, the works! It also greatly reduces the system’s mobility. 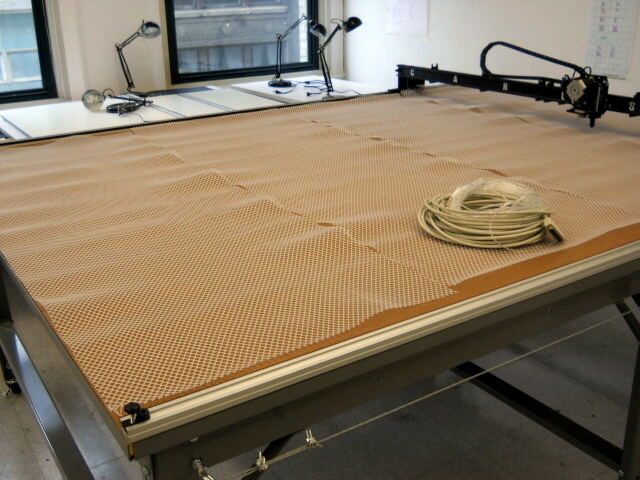 This also means the laser “bed” needs to be enclosed which significantly reduces working area. 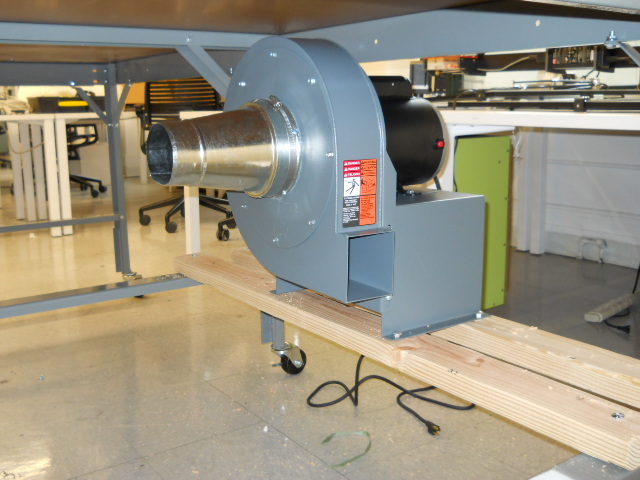 The Studio uses rolling and drag blades which do not create fumes and do not require venting. 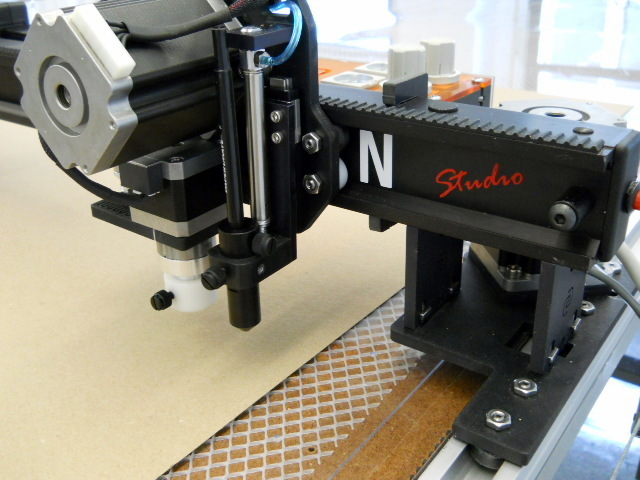 Since the Studio uses drag blades, it can cut small parts that would be burnt or vaporized when using a laser. The laser can also set-fire-to or brown the edges of textiles, limiting their versatility. 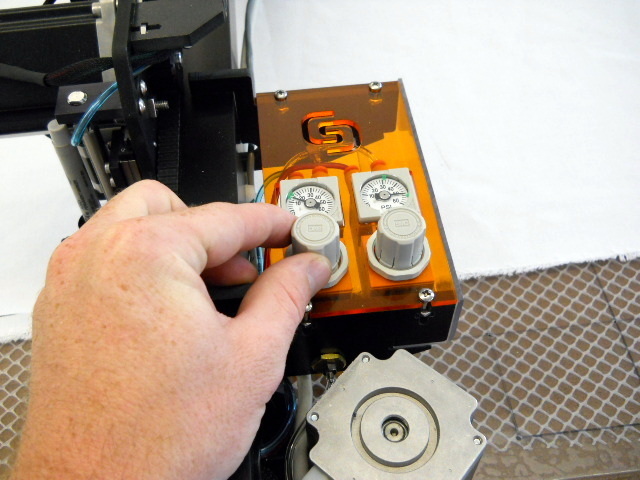 Limited torque motors and recessed "pinch points" make the machine safe for any operator to use. The controls are easy to read and easy to reach. The cutter arrives on a pallet. 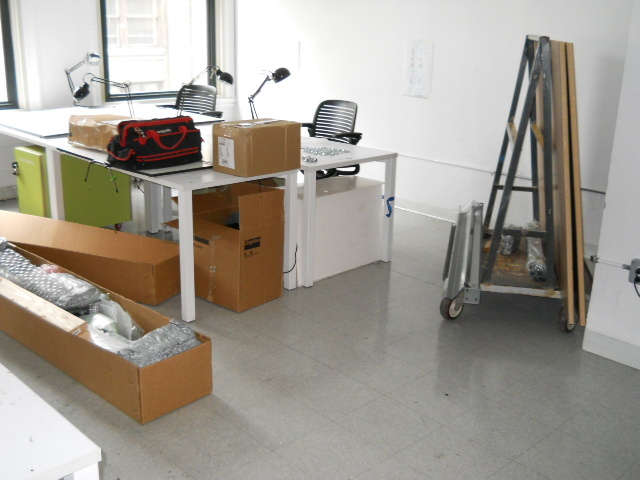 The components are removed and moved individually to the 6th floor. When setting up a Phillocraft vacuum table, the first step is laying out your parts. This will save a lot of time and turns the setup into a one-person job. Phillocraft tables come with a big bag screws. Don't worry you only need a 1/2" and 3/4" socket. 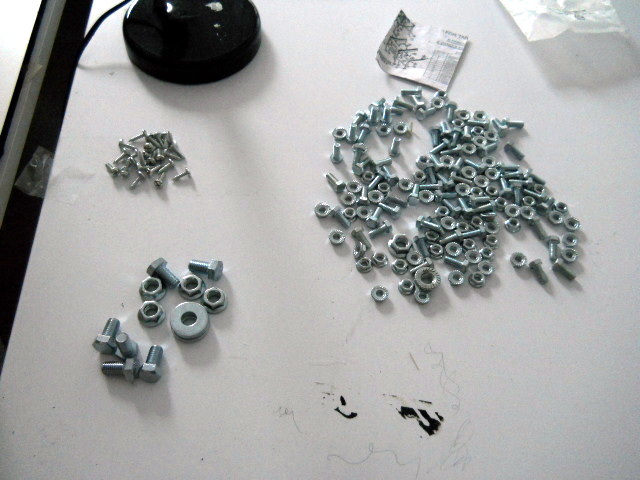 Separate into three piles -- 3/4" nut and bolts for the feet, table top screws, and 1/2" nuts and bolts. The tables have endless steel frames. Identify the ends by the sections with angled edges. These are the lower braces. They mount at the bottom of each leg, across the width of the table. The upper cross member connects table sections. 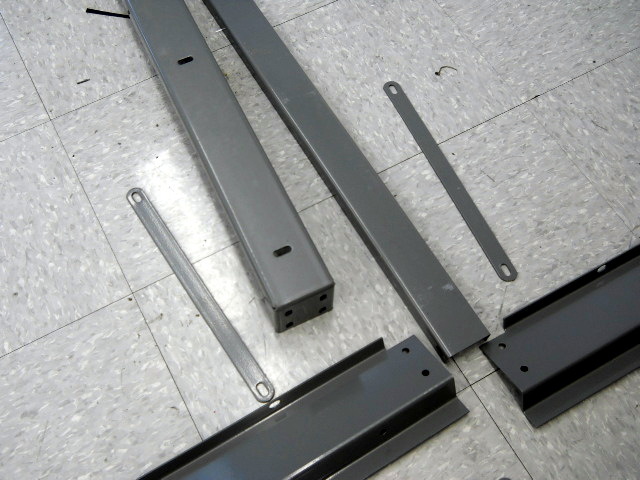 The mounting order from inside out is: Leg, Upper CM, Table Frame. If you only setup a 4' long table you will not use these middle pieces. Long straight braces go from Upper Cross Member to Table leg. 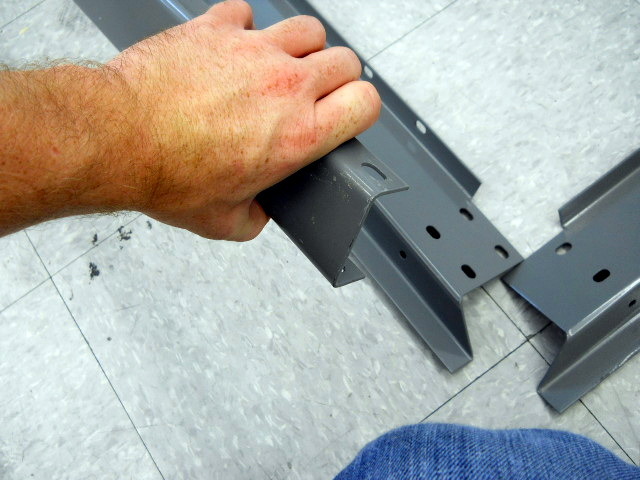 This is a good example when laying out parts near their location will help the table assembly go a lot faster. "Pre-connecting" these support can be helpful. 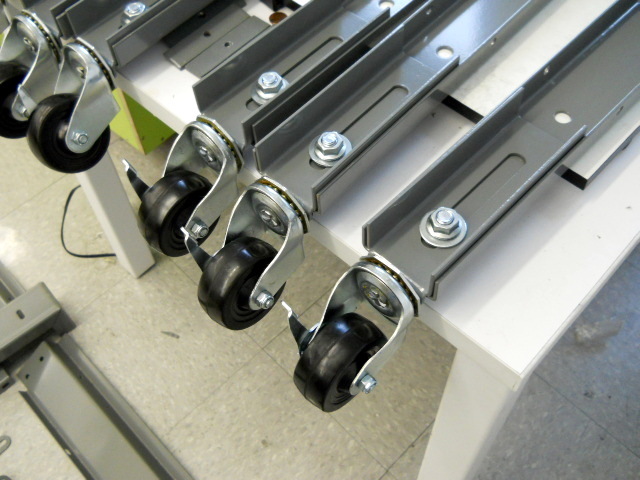 If your table is short, you can attach casters to the feet to make it more mobile. Long tables and production tables need to be leveled for optimum performance. Assemble frame. Finger tighten all 1/2" nuts and blots. 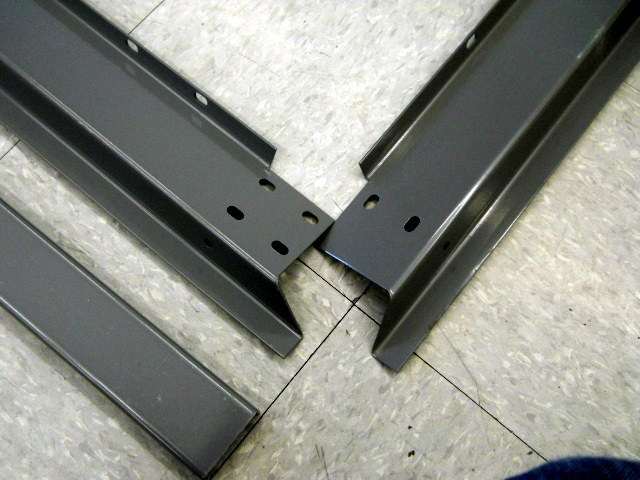 Six metal spacers slide between each adjoining top. Insert tops to square frame. 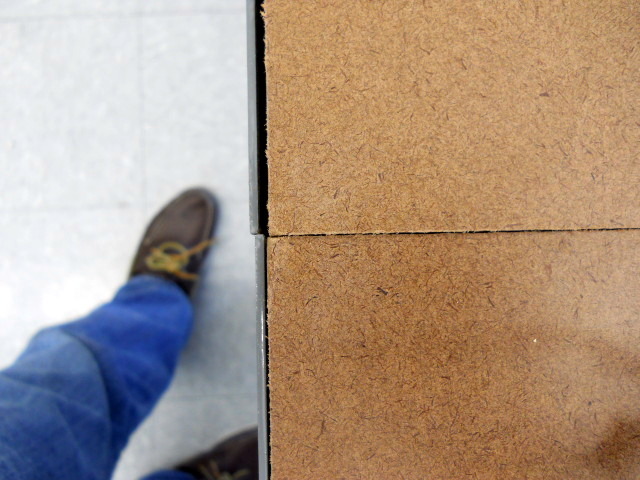 Before tightening, make sure the wooden tops are aligned and square. This is more important than the metal frame looking square. Square the the frame. A magnetic level is very helpful. Using the level, tighten the frame as you go. 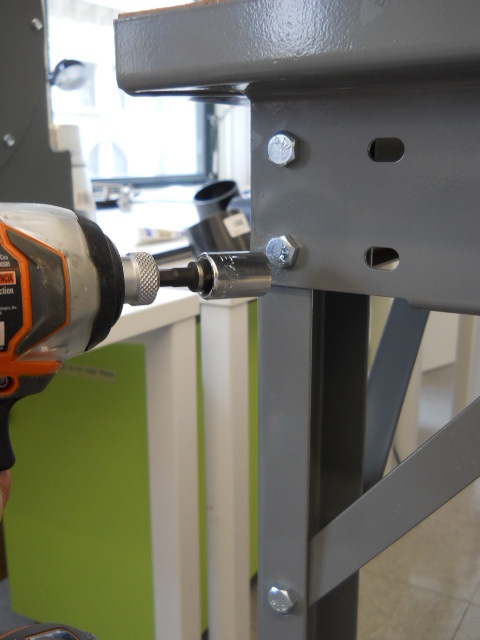 An impact drill with 1/2" socket makes this a quick and painless process even on long tables. When the table is square and level, you can attach one side of your track. Visually align the track so it is as straight as possible. Follow your track installation guide closely -- this is important. Mark and drill an 1/8" pilot hole. Hand tighten your track screw. Check alignment before drilling the next hole. 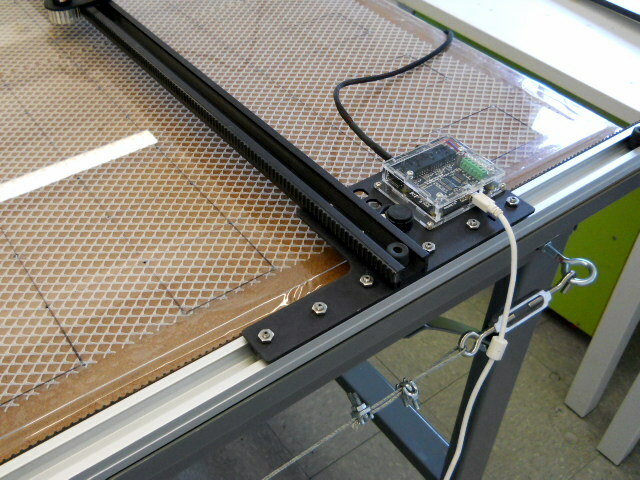 Once "Side A" is secure, slide the plotter/cutter on the table and use it to align and mount "Side B". See your manual for more detail. 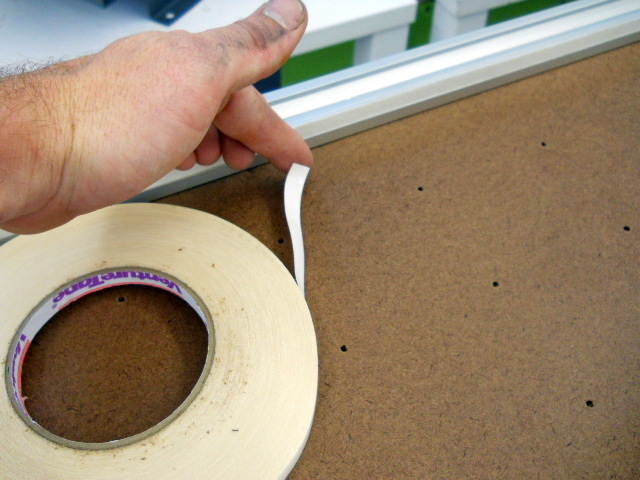 Clean the edge of your track and apply double-sided tape. 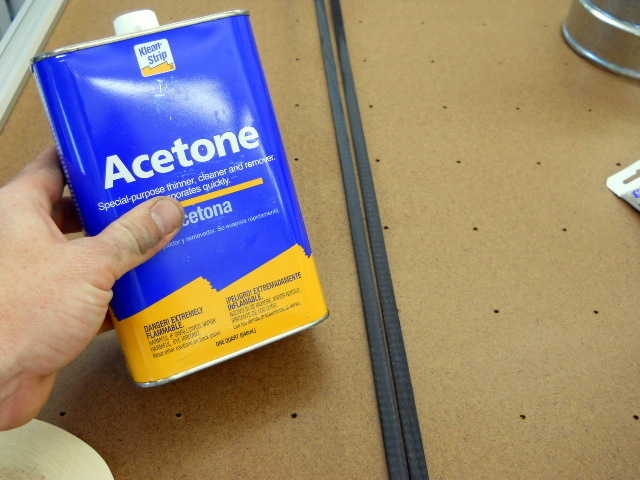 Clean your track belt THOROUGHLY with acetone to remove oils and insure good adhesion to the double-sided tape. Attach the belt with even pressure on both sides. The belt has "peaks" and "valleys". Try to start both sides on a "peak". Install Blower. This is a 1.5HP, 115vac, single phase blower. We mounted it off the floor to make moving the table easier. 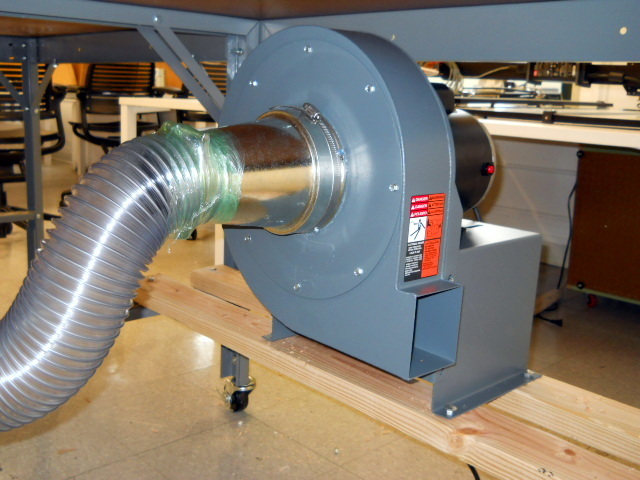 Smaller blowers can use 4" flexible dust collection hose. Connect plumbing as shown in your manual. 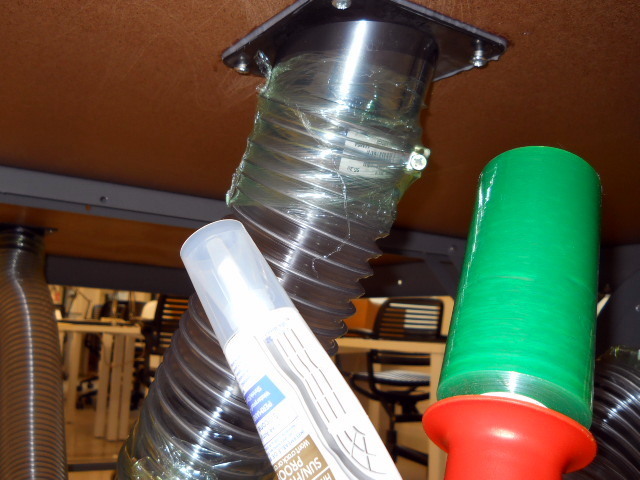 Use silicone or calk to prevent leaks between your table and universal fittings. Wrapping your connections with stretch wrap can also reduce leaks. Plugging leaks significantly improves vacuum performance. Wafting "incense" under the table and watching the smoke is a great way to identify leaks. There are a variety of different techniques for cable management. 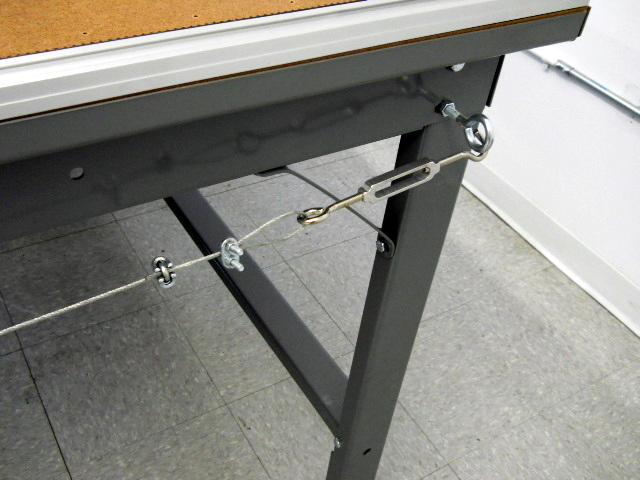 The most common is "overhead", however for short, mobile tables side mount cabling can be a great option. 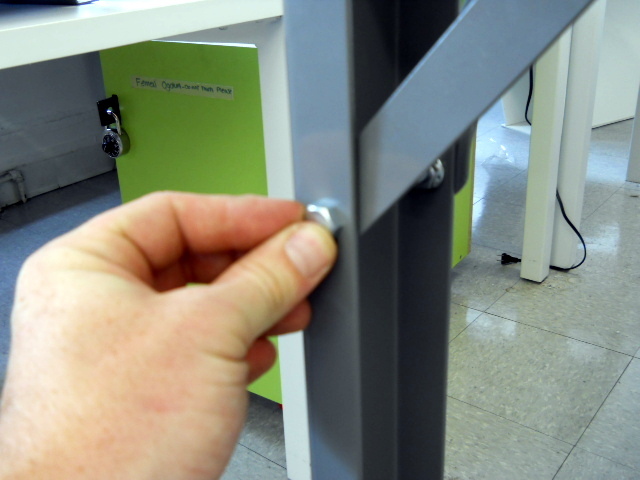 Replace one of the table screws on each end of the table with a 1/"x4" eye bolt. Slide your pulleys on the cable and string. We recommend one pulley every 3-5 feet. use a turnbuckle on one end to tension. If you haven't already, insert track stops. Tighten very securely. Load your computer. Free updates and downloads for Plotmaster are available on the internet to licensed users. Attach your airline to the quick release pneumatic fitting provided. Attach the fitting to an air source. You need at least 90PSI and 1CFM. If you get a small tank air compressor, make sure it's quite so it does not disturb the operator when it "kicks on". Set your pen and cut pressure to the indicated marks. Usually here we would say, “attach your cutting surface”. We like to use 1/16″ polyethylene or polypropylene for most applications. These surface are inexpensive, hard enough for most textiles, but not too hard to quickly dull rotary blades. 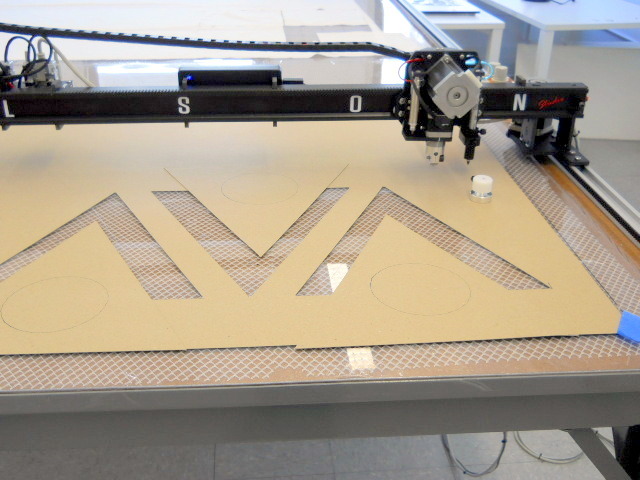 You can read more about which cutting surface to choose here: http://carlsondesign.com/blog/choosing-a-cutting-suface/. 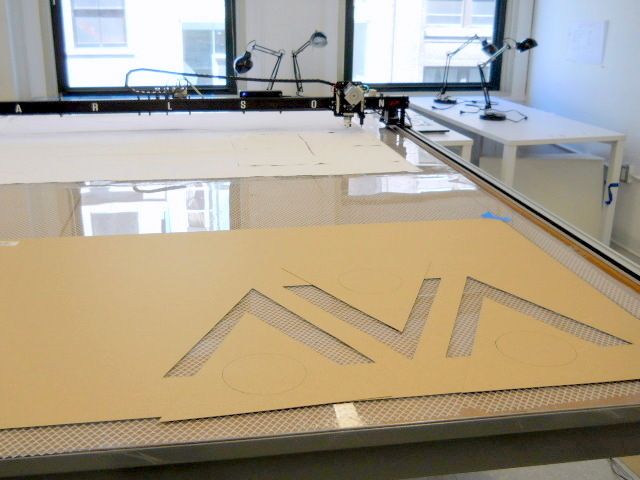 If you purchase a table from Carlson Design, we usually include cutting surface pre-drilled. Unfortunately the shipper thought OUR plastic sheets on the pallet were for shipping protection and they never made it to the room. DON’T WORRY! 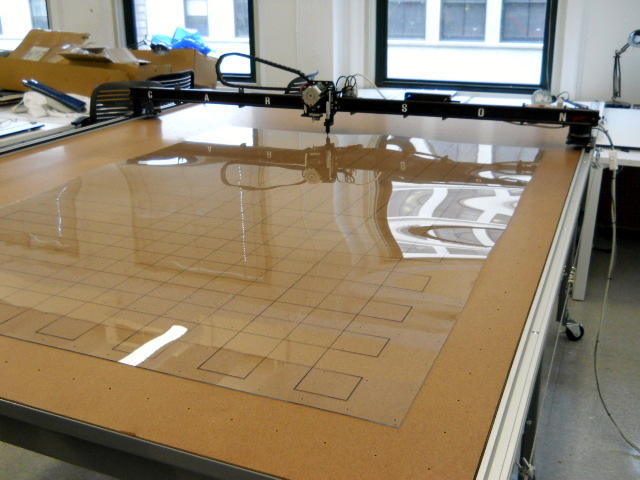 You have a plotter and finding cutting surface locally is never very difficult– even in NYC. At the local hardware store we were able to find sheets of acrylic. Acrylic is not our first choice because it is brittle and a harder on blade life. 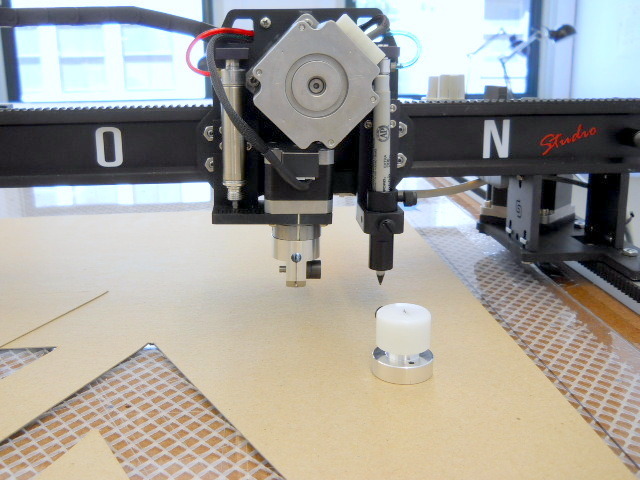 After a few funny looks on the subway we were ready to plot and drill our own plastic cutting surface. Make sure your plastic is cut 6 or 7 inches narrower than your table width. Contact Carlson for a drill pattern. Using a permanent marker, mark the top of your plastic. 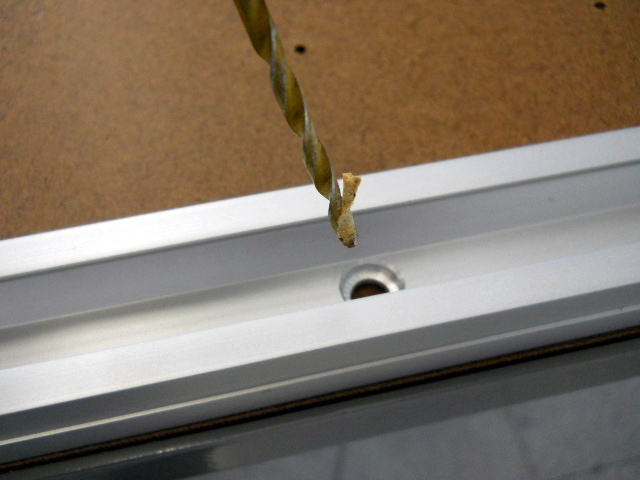 Stack all the sheets and drill using an 1/8" or smaller drill bit, drill the intersections. Cutting surface vacuum holes and table top vacuum holes may not align. 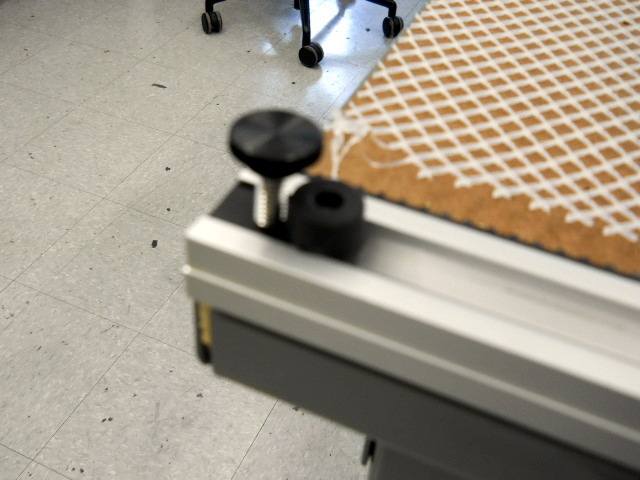 Placing a thick, woven mesh on the table will help create a vacuum channel and improve air flow. Attach the cutting surface. 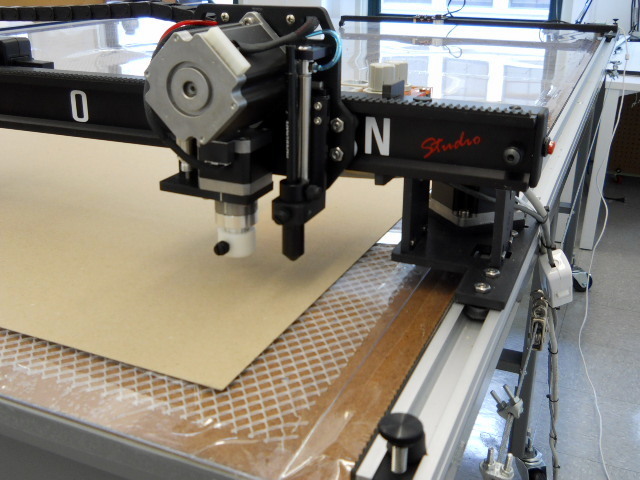 Your plotter/cutter is now installed, ready to get to work. Now that our system is installed, let’s look at a few “beauty shots”. The Studio has a 64" plot/cut working area. This is a little wide for most chipboard, BUT ideal for most textiles. Very versatile indeed! Thank you Parson’s and Mark Bechtel for making this a great install. We cannot wait to see what the New School Students make with the Studio in the fall. Stay tuned.